There’s no doubt that during our 60 years as a business, we have enjoyed working with a great range of people and organisations. 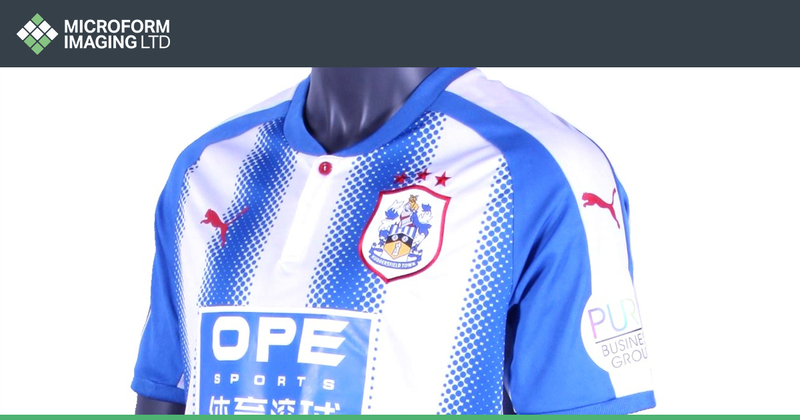 We were quite simply over the moon however, when Huddersfield Town approached us to take 360° images for the team’s 2017/18 home shirt. The club, who is about to enjoy its first ever season in The Premier League, approached us at the start of the summer to utilise our specialist 360° imaging equipment and services. The entire strip can be viewed on the club’s official shop and is available to buy now. Throughout our time, a wide range of companies and organisations have benefited from our 360° imaging facilities, including museums and universities. When it comes to universities, we regularly receive requests to photograph historical artefacts and awards that are special to the university in question. We have also performed services for very well-known and revered objects including the Silverstone Grand Prix F1 Trophy and The Sir Charles Wakefield Trophy for Maximum Speed – the award given to recipients who had beaten the land speed record. We have even been asked to photograph the covers and spines of precious and rare books. All of this means that institutions are able to display prized possessions to guests and visitors without risking the safety of the physical objects themselves. As all our services are totally bespoke, we can arrange for objects to be picked up in our marked and tracked Microform vans, or we can arrange for objects to be photographed on the premises of the client. The images can then be delivered physically, in the form of a hard drive or memory stick, or transferred digitally via a range of technologies such as placement on a cloud management system or a file hosting service such as Dropbox. We have on many an occasion offered our services to individuals looking to use our 360° imaging services for items that they want to preserve or share with others when simple photography will not do. Contact us on 01924 825700 for any questions you might have about our 360° imaging services. Previous Article Can Microfilm and Microfiche be scanned?